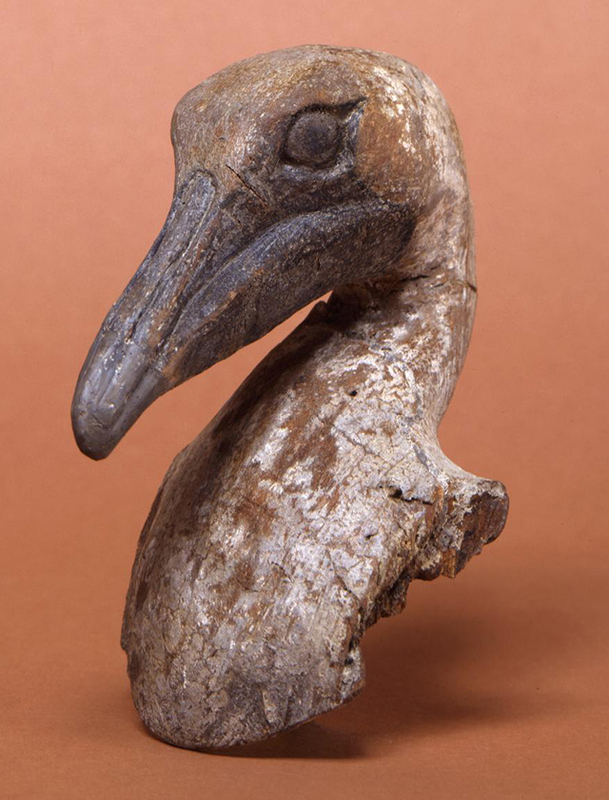 A number of remarkably well-preserved items speak to ancient life in southwest Florida. Winter 2018-19: By Tamara Jager Stewart. Hearing reports of fascinating and incredibly preserved artifacts emerging from the dredged muck on Florida’s southwest coast, Frank Hamilton Cushing with the Bureau of American Ethnology in Washington, D.C. led an expedition to recover these items. The expedition, which was sponsored by William Pepper of the University of Pennsylvania and philanthropist Phoebe Hearst, landed on Key Marco in 1896. Cushing and his small crew began to methodically dig in the boggy area where previous finds had been made by the landowner. They began uncovering perfectly-preserved carved and painted wood, shell, and other artifacts from a previously unknown pre-Columbian civilization Cushing called the “Key Dwellers” and who we have come to know as the Calusa Indians. These artifacts dated to the period between A.D. 500 and 1500. The crew recovered at least twenty-three wooden face masks and carved and painted wooden animal figureheads such as the renowned Key Marco Cat. Cushing surmised that these must have been used ceremonially. 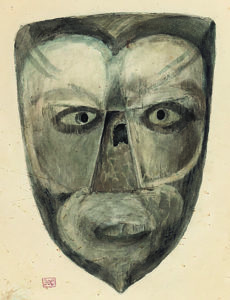 “These [face masks] were found just as they had been put away…in sets, each complete, with its appropriate animal figurehead, and each evidently designed for use by a single priestly actor in the old myth-dramas,” he wrote. The researchers found other objects made of gourds, bone, teeth, antler, and stone as well as a variety of carving tools such as shark-tooth knives. They also uncovered cordage, woven mats, ceramics, and fishing gear. While submerged in the briny muck, the artifacts remained pristine, but once exposed to the air, many disintegrated practically before the researchers’ eyes. 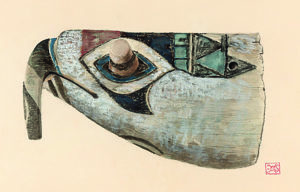 Expedition artist and photographer Wells M. Sawyer captured many of the artifacts’ details in his beautiful watercolor paintings. 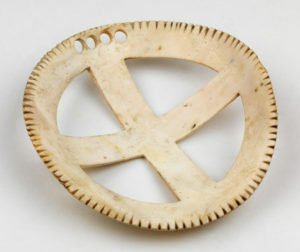 Shell Gorget: This beautifully finished and polished shell gorget was likely worn as a decorative ornament. It has fine notching around the outside edge and a design forming a cross shape that is common in the iconography of the American Southeast. The four perforations at the top allowed the piece to be suspended. Credit: Image courtesy of the Penn Museum, Image #240779. Carved Wooden Figurine: This small, carved wooden figurine is often referred to as a sleeping woman. 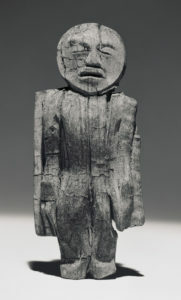 The figurine has a flat, round, mask-like face and is adorned with a square tunic or cloak. 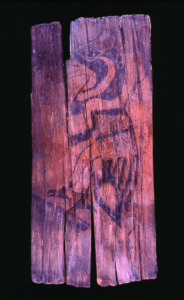 The ancient carvers likely roughed out this and other wooden objects with a shell-bladed adze or gorge, such as were also recovered from Key Marco. The carvers then further shaped and refined the objects with shark-tooth knives and chisels and awls of shell and bone. Credit: Image courtesy of the Penn Museum, Object #40914, Image #147118. 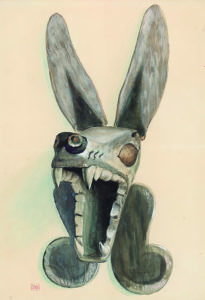 Watercolor paintings of Sea Turtle Figurehead, Wolf Figurehead, and Human Mask: These beautiful watercolor paintings by expedition artist and photographer Wells M. Sawyer were painted in the field in 1896 before the artifacts’ detailed outlines and colors faded. In some cases, the artifacts deteriorated so quickly upon exposure to air that these watercolors are the only existing documentation. Previous articleAmerican Archaeology Winter 2018 is Here!